This installment of Dreamscarred Press’ Monster Classes-series clocks in at 15 pages, 1 page front cover, 1 page editorial, 1 page SRD, leaving us with 12 pages of content, so let’s take a look! 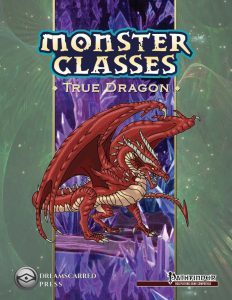 All right, the monster class for dragons covers 20 levels and features d12 HD, 6 + Int skills, proficiency with simple weapons, full BAB-progression, all good saves and +1 natural AC, +1 at every class level gained. Dragons get a TON of natural attacks that increase in power for sizes and thus, a handy presentation with table etc. helps codify these. At 3rd level and every 3 levels thereafter, the dragon increases in age category. Dragons begin play with gliding wings and may use them to fly (50 ft., average maneuverability) at 5th level and increase that speed every 3 levels thereafter by 50 ft, though larger-sized dragons decrease their maneuverability to poor and clumsy, respectively 2nd level and 6th/10th net +10 ft. land speed. 2nd level unlocks the breath weapon (infinite uses, d8s as damage die, 1d4 cooldown) and 7th level has the secondary breath weapon unlock. 3rd level unlocks DR 3/magic, which is upgraded to 5/magic at 7th and 10/magic at 13th level, additionally treating the natural attacks of the dragon as magic. 4th level unlocks spellcasting of a 1st level sorceror, 5th level 120 ft. darkvision, 11th blindsense and if the dragon has a burrow speed, also tremorsense. 6th, 10th and 16th level provide size increases, 9th level SR 11 + HD and 17th frightful presence, though that one has not been properly bolded. Attribute bonus-wise, the dragon gets +10 Str, +6 Con, +4 Int, +2 Wis,+6 Cha for a total of 28 points gained, which isn’t as bad as some installments in the series, but considering…why did I bother listing these again? The pdf provides individual race traits for all base chromatic and metallic dragons…and they influence the base class. Black Dragons get +2 Dex, start off as Tiny, get swim speed equal to land speed, have the water subtype, are immune to acid and can breathe water. Their secondary breath weapon entangles foes, they get the SP to use darkness, which is not italicized, though speak with animals (reptiles only) does have that – it’s gained at level 9, just fyi. The dragon also gets swamp stride at 6th level and the water befouling at 19th. Blue Dragons get +2 Dex, start off as Small, get immunity to paralysis and petrification, have the earth subtype, are immune to electricity and have slow speed, but also burrow speed and tremorsense 5 ft. while burrowing. Their secondary breath weapon knocks foes prone, they get the SP to use ventriloquism, minor image and ghost sound, may create water at-will and at 5th level, imitate sounds. 19th level unlocks a powerful electricity aura. Green Dragons get +2 Dex, start off as Small, get swim speed equal to land speed, have the air subtype, are immune to sleep, paralysis and acid. Their secondary breath weapon entangles foes, they get the SP to use entangle, charm person and suggestion, just fyi. The dragon can breathe water and gains slow speed, but also swim speed equal to base speed. The secondary breath weapon generates plant growth that makes terrain difficult the dragon may ignore. 6th level nets woodland stride and 15th trackless step. Red Dragons get +2 Dex, start off as Small, get slow speed, have the fire subtype and cold vulnerability, are immune to sleep, paralysis and fire. Their secondary breath weapon duplicates obscuring mist (not italicized) and may see through smoke at 6th level. They also get the SP to use detect magic, pyrotechnics and suggestion, just fyi. White Dragons get +2 Dex and Wis, -2 Int, start off as Tiny, get normal speed and burrow speed at 1/2 base speed (with 5 ft. tremorsense while digging), have the cold subtype and fire vulnerability, are immune to sleep, paralysis and cold. Their secondary breath weapon duplicates grease and 1st level provides icewalking. 6th level nets Snow Vision, 9th level ice shaping at-will and 19th level cold aura. Brass Dragons get +2 Dex, start off as Tiny, get normal speed and burrow speed at 1/2 base speed (with 5 ft. tremorsense while digging), have the fire subtype and cold vulnerability, are immune to sleep, paralysis and fire. Their secondary breath weapon is the sleep gas and 9th level nets at-will move earth, 12th level at-will gust of wind. They also get the SP to use speak with animals, endure elements and suggestion, just fyi. Bronze Dragons get +2 Dex, start off as Small, get slow speed and swim speed equal to land speed, have the water subtype, are immune to sleep, paralysis and electricity. They may breathe water. Their secondary breath weapon is the repulsion gas and 9th level nets at-will polymorph, 12th level water mastery. They also get the SP to use speak with animals, create food and water and fog cloud, just fyi. Copper Dragons get +2 Dex, start off as Tiny, get slow speed, have the earth subtype, are immune to sleep, paralysis and acid. They may spider climb at 3rd level and at 6th level age category is added to Craft (traps) and Perception checks to detect traps. The dragon may also defuse magical traps and 9th level provides uncanny dodge. Their secondary breath weapon is the slowing gas. Gold Dragons get +2 Str, start off as Small, get slow speed and swim speed equal to land speed, have the fire subtype and vulnerability to cold and are immune to sleep, paralysis and fire. They may breathe water. Their secondary breath weapon is the weakening gas and 6th level nets polymorph, 9th level locate objects and at 10th level, the fly speed is 50 feet faster than that of another dragon, but at the cost of worse maneuverability12th level water mastery. At 19th level, these dragons can enspell gems to grant luck bonuses. They also get the SP to use detect evil, bless and daylight, just fyi. Silver Dragons get +2 Str, start off as Small, get slow speed, have the cold subtype and fire vulnerability, are immune to sleep, paralysis and cold.. Their secondary breath weapon is the paralyzing gas and 3rd level nets polymorph, 4th level cloudwalking. 9th level improves maneuverability by one step over other dragons and 12th level nets fog vision They also get the SP to use detect evil, feather fall and fog cloud, just fyi. The pdf provides 4 new feats for Half-dragon or Humanoid Forms, multiclass-stacking and Village Burner makes for a cool feat I’ll use for my NPCs, allowing for extended strafing fire via breath weapons. The pdf, as always, features some feat-reprints for our convenience (Flyby Attack, Hold Prey and Multiattack) and a neat glossary. The pdf has no favored class options or age, height and weight tables. Editing and formatting are okay -the pdf sports unnecessary glitches and a couple of annoying formatting hiccups – I am pretty positive that something is missing from the red dragon’s write up, since the dragon is weaker than the others. Layout adheres to Dreamscarred Press’ two-column full color standard and the pdf comes with a second, more printer-friendly version. The pdf has no bookmarks, but needs none at this length. The artwork is okay. Jeffrey Swank has managed to succeed in the task of breaking dragons down as a monster class. The dragons are generally well-balanced…among themselves. Obviously not with regular groups. The problem is that the pdf fails to address a TON of crucial issues: Why aren’t dragons quadruped? What kind of magic item slots do they have? No clue. And there is ANOTHER issue…or rather none: This pdf would have a raison d’être…were it not for Rite Publishing’s brilliant “In the Company of Dragons.” Said book has better player agenda, better balancing, age, height and weight, culture – EVERYTHING. There is not a single discipline where ItC: Dragons does not blow this out of the water. Get that book instead…and if you have it, you can probably use this pdf (provided you got it as part of the subscription) to scavenge alternate racial traits or something. That’s literally the only use for this pdf I can come up with. Get In the Company of Dragons; it’s superior in every single way. Considering the balance-issue, the lack of information and being outclassed this hard, I’ll have to settle on a final verdict of 1 star – I can’t find a reason to use this, unless you have the subscription and are unwilling to get ItC: Dragons. You can get this here on OBS. You can get the whole subscription (it does have some gems) here on OBS! You can support Dreamscarred Press directly here on patreon!